Oracle Apps 11i Free Training : Concurrent Processing : This document talks about the concurrent processing in oracle applications. 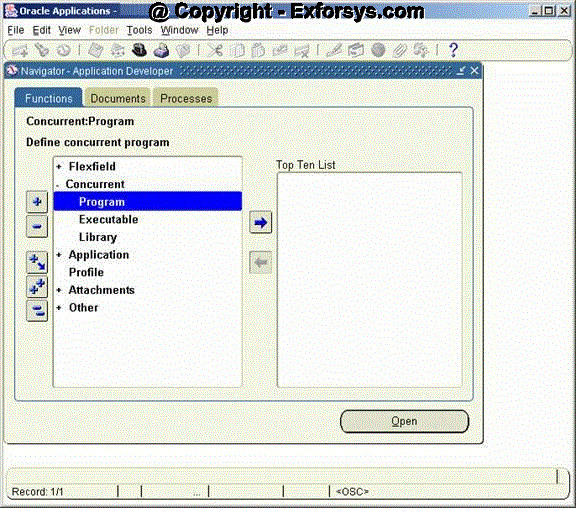 It will give the step-by-step procedure of creating concurrent programs in oracle applications. All types of concurrent programs are described in detail. Concurrent programs can be scheduled to run or manually run in oracle applications. In Oracle Applications, concurrent processing simultaneously executes programs running in the background with online operations to fully utilize your hardware capacity, hence the name ‘Concurrent Processing’. You can write a program (called a ”concurrent program”) that runs as a concurrent process. Typically, you create concurrent programs for long–running, data–intensive tasks, such as posting a journal or generating a report. The first step in creating a concurrent program in oracle applications is to create the concurrent program executable. To do this, navigate to Application Developer responsibility after you login to Oracle Applications. To login, you can take the help of the ‘Topic11 – Oracle Applications Login Document’. i) Executable – Enter executable name here. Enter any user friendly name. ii) Short Name – Enter short name for your executable. This is used for mapping the executable with the concurrent program. Usually executable name are of 8 characters. iii) Application – Give the application to which the executable belongs to. E.g. you want some program to run from oracle payables then account payables should be entered as application name. iv) Description – Give the brief description of the executable in this field. v) Execution Method – Here you need to choose the appropriate execution method for your executable. Following are the possible execution methods which are commonly used in oracle applications. SQL*Plus – used to run the anonymous PL/SQL blocks. It will get executed in the same fashion as you are running on SQL Plus. Java Stored Procedure – The execution file is a Java stored procedure. Java Concurrent Program – Used for program written in Java. Spawned – used for c or pro*c Program. Mainly used by standard oracle interfaces. Perl Concurrent Program – used for programs written in CGI Perl. Request Set Stage Function – PL/SQL stored function that can be used to calculate the completion statuses of request set stages. Immediate – execution file is a program written to run as subroutine of the concurrent manager. Oracle doesn’t recommend use of this executable type. Multi-Language function – execution file is an MLS function that supports running concurrent program in multiple languages. iv) Description – Give the brief description of the concurrent program. v) Executable – Enter the short name of the executable (Defined in Executables Screen) you want to attach to this concurrent program. x) MLS Function – This feature allows the program to be submitted once by the user but runs it in the multiple languages. iii) Conflicts Domain – Enter the parameter which will hold the value of the conflict domain of the program. iv) Security Group – This field is for HRMS security only. Constant : The default value can be any literal value. Profile : The default value is the current value in the user profile option defined in the Default Value field. Use the profile option name, not the end–user name. You do not need to include $PROFILE$. SQL Statement : The default value is determined by the SQL statement you defined in the Default Value field. Segment : The default value is the value entered in a prior segment of the same parameter window. xiii) Token – For a parameter in an Oracle Reports program, the keyword or parameter appears here. The value is case insensitive. For other types of programs, you can skip this field. vi) Type – Enter Domain or Global. If you choose Domain, the incompatibility is resolved at a domain-specific level. If you choose Global, then this concurrent program will be considered globally incompatible with your concurrent program, regardless of which domain it is running in. iii) Optimizer mode – Optionally specify an optimizer mode. You can choose ALL_ROWS, FIRST_ROWS, Rules, or Choose. You would specify an optimizer mode only for a custom program that may not perform well with the default cost-based optimizer (CBO) and needs tuning. You can use a different optimizer mode until your program is tuned for CBO. « « Can I Really Get a Signing Bonus?